Professional and reliable on AA/AAA/C/D/18650/Cordless Phone Rechargeable Batteries and Battery Chargers. 1. Quantity: 16 Counts AA 2800mAh Ni-MH rechargeable batteries. 7. Doesn't contain Hg/Cd/Pb, no pollution to the environment. 8. Great for high power demand devices such as digital camera, children' toys and so on. *Back-to-School Offer* ProCyco technology with UL certifed Cells - extend lifespan up to 1200 cycles. 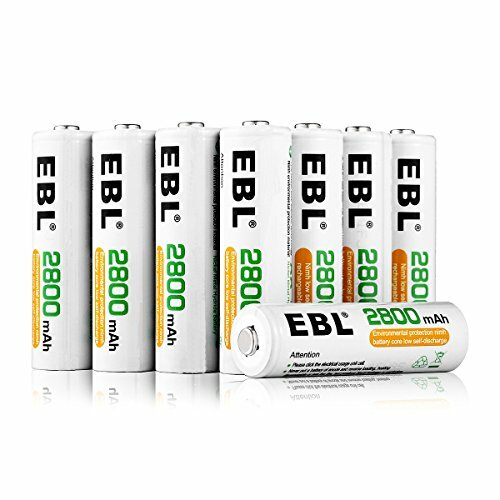 High capacity - No longer to worry about the endurance of the batteries, EBL 2800mAh will provide ultra strong power for your devices to performance well and operate longer. Safety assurance - Ni-MH eco-friendly cell, doesn't contain Hg/Cd/Pb, makes no pollution to the environment, and using DBCK steel shell which can protect the battery against explosion due to overpressure.